The Five Spot gave birth to careers of neo-soul stars such as Jill Scott, India.Arie, Jazmine Sullivan and musiq. Row performed there while she studied as a grad student at Drexel University. In 2007, a fire destroyed The Five Spot. The Harrisburg-based singer/songwriter/producer says she began honing her writing skills after that tragedy. Today, she and local singer Dexter Kendrick pen songs and produce through their company called Polarity. Before forming Polarity and performing in Philly, Row sang in church and in a local group named Untitled. Untitled was a protégé of a 90s group from Harrisburg. 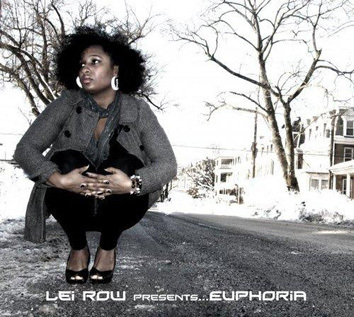 Row credits her signing experience and feelings when talking about her new mixtape Euphoria. “I was inspired by my own broken heart,” she admits. She borrows beats from the late great producer J. Dilla on “Luvwounds” on “Luvstruction.” Her vocals ride the beats effortlessly on those songs. Row loves how Dilla succeeded at producing and rapping. “I’m a hip-hop fanatic—but I can’t rap,” she says while grinning. To show her passion for hip-hop, she allows rappers Mon E. Millions and K. Wills to spit on Euphoria. Local producer Aganee provides a pounding bassline on “Slowtime,” one of the best songs on the disc. Row sings about heartbreak on “Slowtime.” “Smoking and drinking is all I do/To help me recollect and think things through …” Producer F. Silver and producer/writer/rapper Grip join Aganee on “Micromanagement,” a banger about a significant other who is a control freak. “I can’t take this sh*t no more,” Row vents on “Micromanagement.” The singer uses beats from other hits, including Melanie Fiona’s “If It Kills Me.” Like Fiona, Row wears her heart on her sleeve on this breakup song (“Happy Now”). With a solid mixtape (and ill album art—props to photographer Michelle G.), Row proves that she’s not going to pigeonhole herself in just one musical genre. This is a great review of a great artist. The future is extremely bright for this talented young lady! Keep up the good work. Poetic, passionate, and ambitiously talented Lei Row has done the damn thing with this album. I’m very impressed with her dedication to put out quality music in a “lacking substance” talent era. Her lyrics are true and from the heart and she has a bright and fruitful future in the music industry.